Supplier & Distributor of Non Linear Junction Detector. Our product range also comprises of CCTV Camera, CCTV DVR Video Recorders and Accessories and CCTV IP Megapixel Camera. Keeping track with the market development, we are engaged in providing our clients Non Linear Junction Detector. It is designed to find specialized covert surveillance equipment containing semi-conductor components. The entire range of detector is used for counter- surveillance search works in premises, transport and outdoors. Our offered detector is availed from us at competitive price. The non-linear junction detector “LORNET” is used for counter- surveillance search works in premises, transport and outdoors. 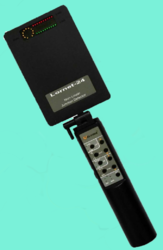 It is designed to find specialized covert surveillance equipment containing semi-conductor components “LORNET” has a built-in automatic frequency selection system and it can tune away from the narrowband interference automatically (selecting a 2nd harmonic receiving channel with the minimum noise level). Operation time with a built-in battery (pulse/CW) : 3.5h / 1.5 h.